Ques.101. How can we run a Test method multiple times in a loop(without using any data provider)? Ans. Using invocationCount parameter and setting its value to an integer value, makes the test method to run n number of times in a loop. Ques.102. What is the default priority of test cases in TestNG? Ans. The default priority of test when not specified is integer value 0. So, if we have one test case with priority 1 and one without any priority then the test without any priority value will get executed first (as default value will be 0 and tests with lower priority are executed first). Ques.103. What is the difference between soft assertion and hard assertion in TestNG? Ans. 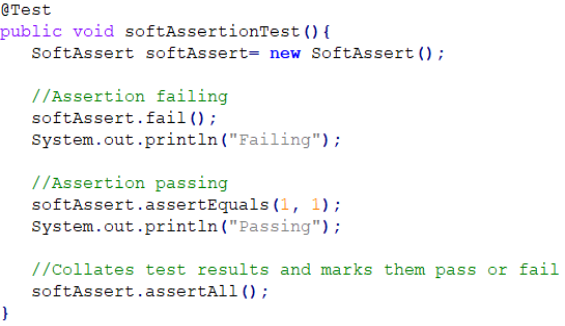 Soft assertions (SoftAssert) allows us to have multiple assertions within a test method, even when an assertion fails the test method continues with the remaining test execution. 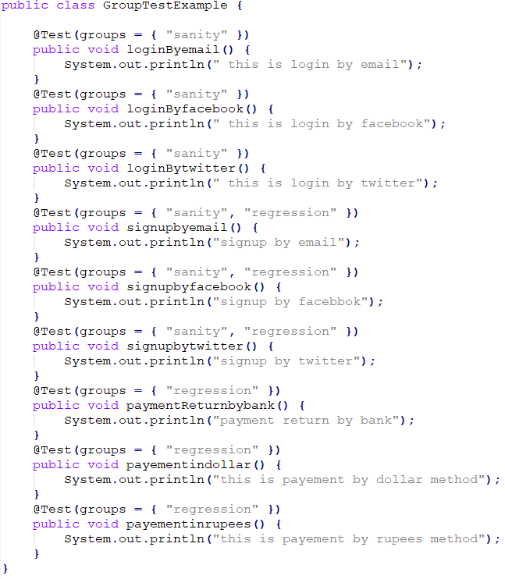 The result of all the assertions can be collated at the end using softAssert.assertAll() method. Here, even though the first assertion fails still the test will continue with execution and print the message below the second assertion. Hard assertions on the other hand are the usual assertions prodived by TestNG. In case of hard assertion in case of any failure, the test execution stops, preventing execution of any further steps within the test method. Ques.104. How to fail a testNG test if it doesn't get executed within a specified time? Ans. We can use timeOut attribute of @Test annotation. The value assigned to this timeOut attribute will act as an upperbound, if test doesn't get executed within this time frame then it will fail with timeOut exception. Ques.105. How can we skip a test case conditionally? Ans. Using SkipException, we can conditionally skip a test case. On throwing the skipException, the test method marked as skipped in the test execution report and any statement after throwing the exception will not get executed. Ques.106. How can we make sure a test method runs even if the test methods or groups on which it depends fail or get skipped? Ans. Using "alwaysRun" attribute of @Test annotation, we can make sure the test method will run even if the test methods or groups on which it depends fail or get skipped. Here, even though the parentTest failed, the dependentTest will not get skipped instead it will executed because of "alwaysRun=true". In case, we remove the "alwaysRun=true" attribute from @Test then the report will show one failure and one skipped test, without trying to run the dependentTest method. Ques.107. Why and how will you use an Excel Sheet in your project? The reason we use Excel sheets is because it can be used as data source for tests. An excel sheet can also be used to store the data set while performing DataDriven Testing. Ques.108. How can you redirect browsing from a browser through some proxy? We can scroll down a page by using window.scrollBy() function. Ques.110. How to scroll down to a particular element? To scroll down to a particular element on a web page, we can use the function scrollIntoView(). Ques.111. How to set the size of browser window using Selenium? To resize the current window to a particular dimension, you can use the setSize() method. Ques.112. Can we enter text without using sendKeys()? Ques.113. Explain how you will login into any site if it is showing any authentication popup for username and password? Since there will be popup for logging in, we need to use the explicit command and verify if the alert is actually present. Only if the alert is present, we need to pass the username and password credentials. Ques.114. 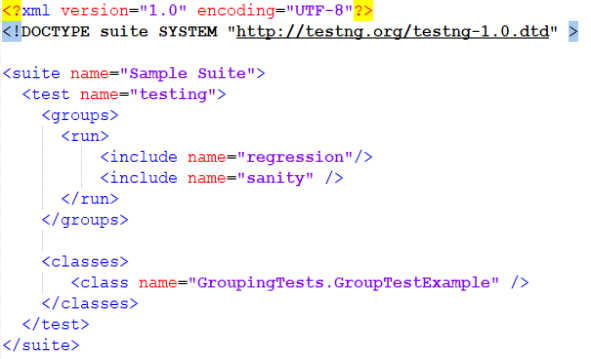 Explain what is Group Test in TestNG? Ques.116. What is Stale Element Exception? How to handle it? Stale means old, decayed, no longer fresh. Stale Element means an old element or no longer available element. Assume there is an element that is found on a web page referenced as a WebElement in WebDriver. If the DOM changes then the WebElement goes stale. If we try to interact with an element which is staled then the StaleElementReferenceException is thrown. When this happens you will need to refresh your reference, or find the element again. Ques.117. What are different XPath functions that you have used in your Project? Ques.118. What will happen in background when execute new FirefoxDriver() ? Firefox binary will be triggered and Fiefox browser will open with default options. WebDriver is an interface which contain several abstract methods such as get(...), findElamentBy(...) etc. We simply create reference of web Driver and we can assign objects (Firefox driver, ChromeDriver, IEDriver, Andriod driver etc) to it. Ques.120. How do you handle inner Frames and Adjacent Frames? Use SwitchTo frame to move the control inside frame. Ques.121. 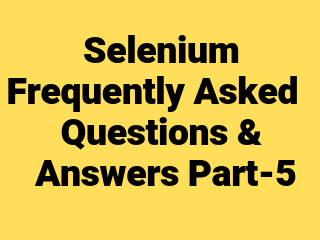 How to click on an element which is not visible using selenium WebDriver? Ques.122. Difference between verify and assert? Assert: Assert command checks if the given condition is true or false. If the condition is true, the program control will execute the next phase of testing, and if the condition is false, execution will stop and nothing will be executed. Verify: Verify command also checks if the given condition is true or false. It doesn't halts program execution i.e. any failure during verification would not stop the execution and all the test phases would be executed. Ques.123. What is the use of @FindBy annotation? @FindBy is used to identify element in the Page Factory approach. Ques.124. Do you use Thread.sleep? Ques.125. What are different pop-ups that you have handle in your projects?